In S&P 500 companies, women account for 14.2% of top executive positions and only 24 CEO positions. Women represent 46% of entry-level professionals, 29% of vice presidents, and 19% of C-suite executives. Companies with 50% of women in senior operating roles show 19% higher return on equity (ROE) on average. The most gender-diverse companies are 15% more likely to have financial returns above their industry averages. Based on this information, there are two logical conclusions we can come to: (1) gender disparity still exists in leadership and (2) gender diversity is beneficial to the bottom line of organizations. There has been a lot of attention on women trying to break the glass ceiling and to “lean in,” but progress has been very slow. Frustrated by progress, or lack thereof, a group of CEOs, executives, board chairpersons, and academics (including those from Accenture, Bank of America, CocaCola, Huffington Post, and LinkedIn) came together and launched a coalition called Paradigm for Parity. Whether employees know it or not, there are often unconscious biases that people embody towards women holding positions of power. It’s important to address these head-on by making sure that everyone, especially senior leadership, understand and address the biases that prevent women from succeeding. Work towards full gender parity by improving how you recruit and hire leaders. 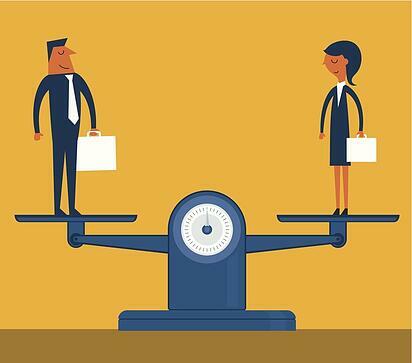 You can do this by creating gender-neutral job descriptions, requiring diverse hiring slates (e.g., 50-50), using a diverse group of interviewers to avoid the “just like me” bias, or implementing objective assessments early in the process. The goal of these efforts is to start with a diverse pool of qualified candidates so you can choose the candidate best for the position and not worry about excluding one category. Additionally, companies could endorse a “70% Rule” by making it a requirement that no single majority group can represent more than 70% of the participants (e.g., consortiums, high-potential groups, meetings). This rule symbolizes an organizational commitment to diversity. In order to progress, it’s important to clearly outline aggressive, but achievable goals. For example, the senior leadership team may identify when it’s realistic to achieve 30% parity and then communicate this goal more broadly. This transparency holds the senior leadership team accountable and drives the rest of the organization towards this goal. It’s also very important to provide progress updates so you can track towards your goal. Today’s workplace tends to allow much more flexibility than previously. Employees have more flexibility to work remotely, to set their own schedule, to cross-train, and to take vacation days more freely. Today’s employees expect this perk. It’s important that you don’t penalize employees because they take advantage of these opportunities. Employees should be assessed based on the results they demonstrate, not their presence. An important element of achieving parity is providing female employees sponsors, or people within the company actively advocating for their advancement. In particular, a recent study in the Harvard Business Review by Katina Sawyer and Anna Marie Valerio demonstrated that not only do male sponsors help level the playing field for their female protégés, but they also tend to do so by involving both men and women to help with advancement. This can ultimately create a more diverse and inclusive company culture. Achieving full parity sounds ambitious, but it behooves companies to achieve greater diversity in leadership to see business gains. As these steps from Paradigm for Parity point out, companies should start with small, short-term goals, establish systems to work incrementally towards these goals and communicate and monitor progress regularly. Taking concerted steps like these can create gains to be proud of.